The Radio-frequency ID tags smaller than a grain of rice are embedded in the core of a ball during the manufacturing process. Tiny radio transceivers are embedded in the ball’s core. 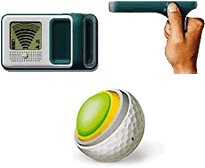 When the ball disappears into the bushes, the duffer activates a handheld device that sends out a 915-MHz signal. The ball sends back its own signal, causing the handheld to beep faster and at a higher pitch as it gets closer to the ball.